Smartrike Folding Trike 700 with the revolutionary new smarTfold™ is the first Grow With Me trike that folds to less than 85% of its original size, making it both compact and portable. The quick click design enables folding and unfolding the trike within seconds and no tools required. The Smart fold 700 folding trike is a deluxe 8 in 1 trike (6-36m). the high-back seat swivels to face the parent & reclines for nap times. It converts from a baby trike into a training tricycle for 1 year old toddlers and a tricycle for 2 years old kids. Forget about spending time & money on accessories your baby will quickly outgrow. From a tricycle with push handle suitable for 6 months old babies, this Smart trike transforms easily into any of its 8 stages, a perfect tricycle for your little angel. The Smart fold 700 is a tricycle built for utility, safety & convenience. It's durable, Lightweight and portable design makes it a perfect travel toddler tricycle that fits in any car and grows with your baby until they are ready to pedal and steer independently. Premium quality that you can trust. When it comes to your child's trike, there's no room for compromise. All smarTrike kids’ tricycles and Smart fold foldable trikes are made with nothing but the best materials and undergo strict quality control. 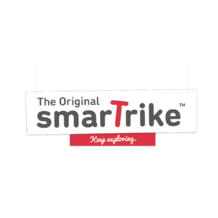 At smarTrike, we take pride in creating the finest baby trike designs. We work constantly to improve our kids tricycles so we can make toddlers' happier and parents' lives easier. Our Smart fold folding trikes follow these high standards and expectations!